1/24 Zundapp KS 750 Motorcycle with sidecar Discounts Apply ! TAS24004 - 1/24 Zundapp KS 750 Motorcycle with sidecar. 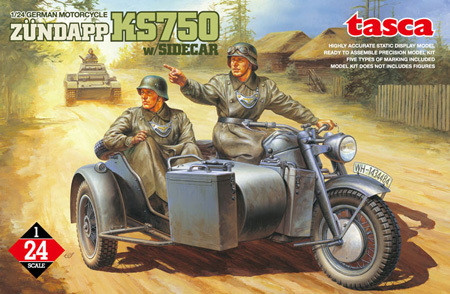 The second release in the 1 / 24 scale series is the Zundapp KS750 motorcycle with sidecar, widely used by the German army during World War II. Total length 87mm, Width about 69mm, and Height 42mm. Contains approximately 180 parts. Engine, drive shaft, and gear case precisely reproduced. The sidecar frame modeled using the BW40 torsion bar suspension. We have accurately represented the exact cross section and shape of the sidecar with attention to the upward spread of the sides. The tires are constructed using a sandwich system of six parts to reproduce the extreme fineness of the spokes possible at the limits of injection molding. The Motorcycle can also be exhibited detached from the sidecar. The air cleaner has two types available, Standard and Tropical. Details include using a metal coil spring in the driver's seat. Includes a clear lens part for the light. Comes with a metal wire for applying brake cables, piping, etc. Figures are not included in the kit. Jerry can comes in 1/24th scale as an accessory. Five types of Decals including German Army Eastern Front, and Africa Corp in Tunisia. This product is molded in German gray. Figures for the motorcycle are currently being planned. Discontinued item!